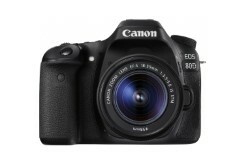 Amazon India is selling Canon EOS 80D (EF-S18-55 IS STM) 24.2 MP DSLR Camera (Black) Rs. 78734 Paytm Wallet Cashback of Rs. 7873 only at lowest and best price online.Use promocode CAMERA10 to get 10% cashback You can follow the below steps to buy this product at their deal price.Keep Visiting dealsheaven.in for more Best offers ,hot online deals, promo code, coupons and discount . Canon EOS 80D with 18-55 mm Lens is packed with advanced features that make it ideal for every professional photographer. The powerful CMOS sensor captures high-resolution images and HD quality videos. With the image stabilizing feature and shutter speed control, this camera can capture moving objects in stunning detail. Featuring a 45-point all cross-type Auto Focus system that provides highly precise focus in any light. The Intelligent Viewfinder with approximately 100 percent coverage offers a clear field of view to the user. You can use the HDMI port to see the videos and images on HDTV. This camera comes with a 18-55mm lens that pushes its performance even further. It provides optimum control over the focus and ensure better image stabilization. 45 Point all Cross Type AF system that provides High Speed, Highly precise AF in virtually any kind of light. An Intelligent Viewfinder with approximately 100 Percent coverage provides a clear view and comprehensive image data. Improvements like a powerful 24.2 MP (APS-C) CMOS sensor and Dual Pixel CMOS AF for Live View shooting enhance the EOS 80D's performance across the board. Merging power, precision and operability, the EOS 80D is a dynamic SLR Camera for anyone. Screen Size: 7.62 cm (3) to 9.90 cm (3.9).